Ailsa Craig is depicted on our Lodge tie, Mark token and commemorative jewels. 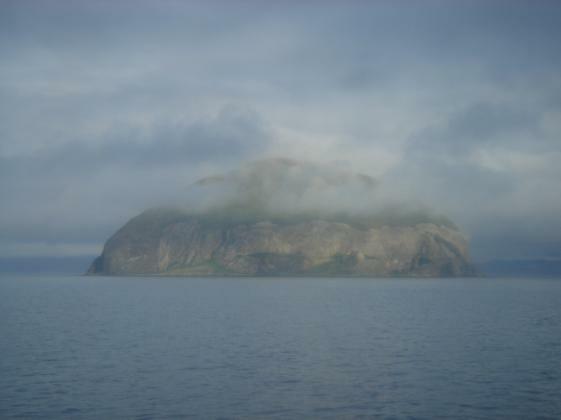 It is a small rocky island which guards the entrance to the Firth of Clyde. It lies 16Kms (10 miles) from Girvan on the coast of the District of Kyle and Carrick (in the Parish of Dailly) and 34Kms (21 miles) from Southend on the Kintyre Peninsula. It is in fact the vast plug of a long vanished volcano, and its volcanic granite, very long grained, has long been used to make the worlds best curling stones. It is known as "Paddy's Milestone" being situated roughly halfway between Glasgow and Belfast. Most of the islands buildings are situated on the flat land on the eastern side. Here the tenants, who earned a living working the rock for the curling stones and keeping sheep and goats, occupied a cottage during the summer months. Nearby there is a lighthouse and the island even has a gasworks which once supplied the light and ran the machinery which compressed air for the two foghorns one on the north end of the island and one on the south. The quarrying of the blue horne stone ceased in 1971 with the automation of the lighthouse and there are now no permanent residents living on the island.